For immediate access to our entire media kit, please take a moment to complete the following information. Once you submit it, a media kit pdf file will download directly to your computer. Media kit information is for internal use only. 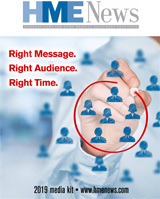 Thank you for your interest in HME News.